You can add this beautiful scarf to your wardrobe for just $7.49! Here’s how to style it. Hey ladies! Happy February! Can you believe that Valentine’s Day is only a little over a week away? I know I can’t. I’m obsessed with Valentine’s Day for many reasons. Some people say that it’s a day reserved exclusively for couples. While celebrating with that special someone is great, I think there is so much more to Valentine’s Day than that! It celebrates all kinds the kinds of love that exist in your life. Now that is something worth celebrating. So no matter your relationship status, celebrate all the different kinds of love in your life this year. Send cards, give hugs and eat lots of candy with those people you care most about. Remember, they’re the ones who will always stand by you in thick and thin! This week’s fabulous find item is so stunning. Whether you’re getting it for yourself or as a gift for someone, it’ll keep you looking stylish this Valentine’s Day! 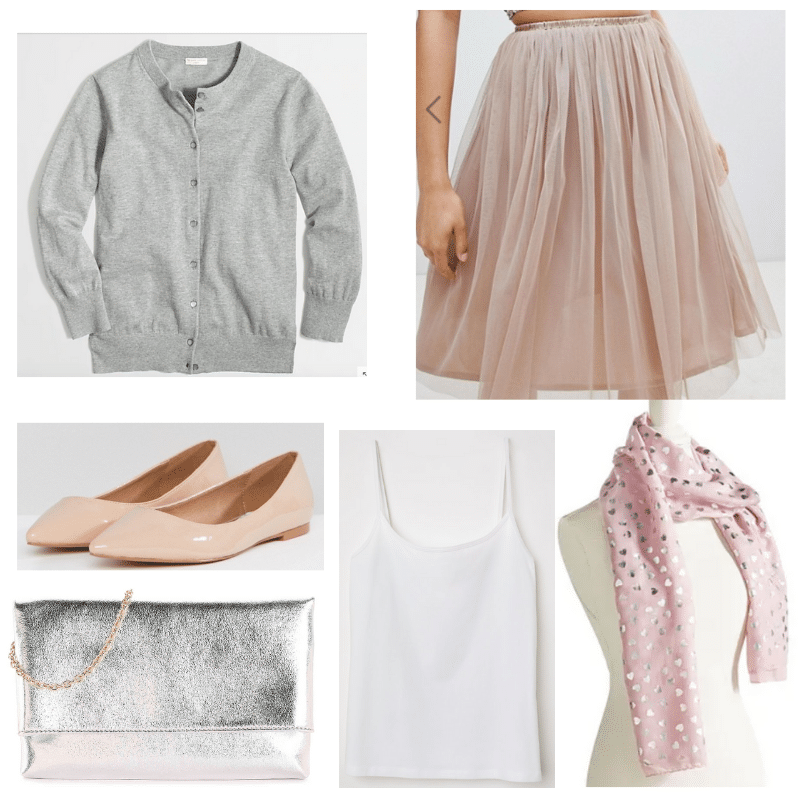 I love the beautiful combination of light pink and silver! It’s perfect for Valentine’s Day but you could 100% pull it off any time of year. Just throw it on whenever you want to feel the love. You can get this gorgeous piece from Pier 1. I know what you’re thinking: since when do they sell accessories? I was shocked to learn as well and now I’m over the moon. The best part you ask, well that has to be the price! You can add this beautiful scarf to your wardrobe for only $7.49. What are you waiting for, ladies? This outfit is like workout chic! The silver metallic leggings are SO fabulous. They have a very flattering fit and are such a statement piece. Continuing with the vibrant colors we have glitter Kate Spade Keds that will remind everyone around you that sneakers CAN be fabulous. I’ve written about this brand before but I can’t emphasize how much I love elf cosmetics. I personally use their products as part of my daily routine and am obsessed. Not to mention they are incredibly inexpensive. You can get this lipgloss for only $3.50! This outfit has SO many great deals. Aside from the scarf which is practically a steal, the tank top is only $2.99. Every girl needs good tank tops in her closet in a variety of colors! They’re so practical and you can wear them whenever. With this amazing price, you can get several without breaking the bank. The ASOS flats are also such a great deal. They’re only $16 for a shoe that is super durable and will last you years. Not to mention they are neutral and go with EVERYTHING in your closet. It’s almost too good to be true. 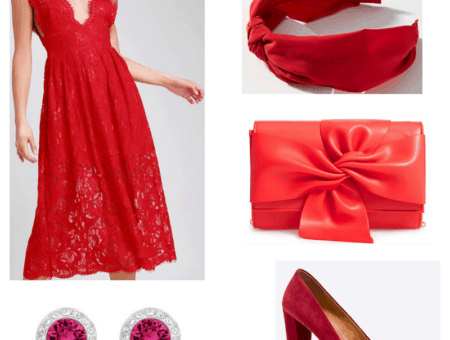 This is the perfect outfit for a Valentine’s date or night out with friends. The dress is super sweet and flirty. I love the subtle ruffles and cut. Be sure to check out Lulu’s Valentine’s Day dresses. Each one is more beautiful than the next! I’m also a big fan of the clutch. 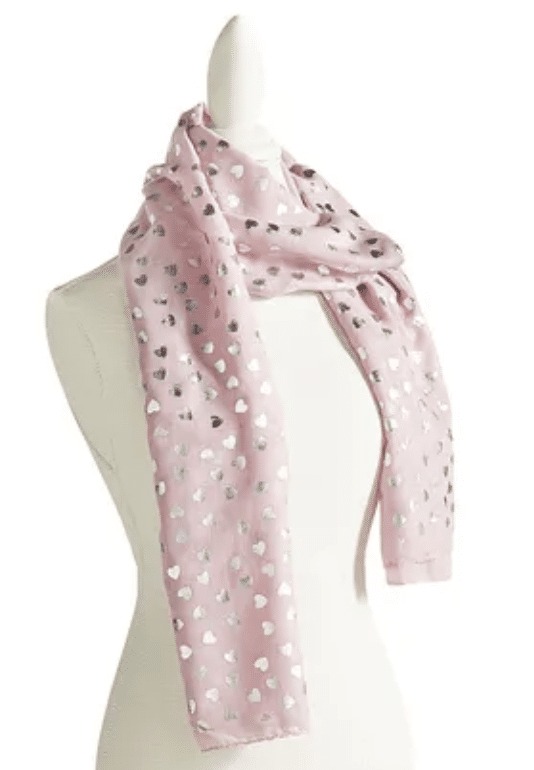 The silver heart goes perfectly with the ones on the scarf and it’s such a fun statement piece. Some people might say that you can only wear it one night a year. They couldn’t be more wrong. 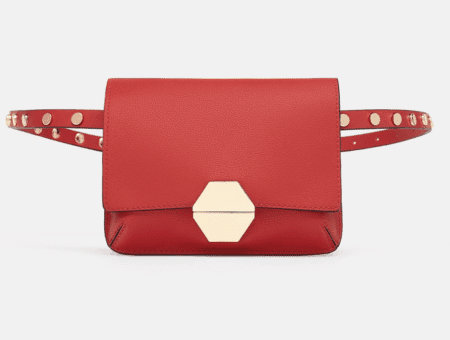 Carrying this clutch will remind you of the one’s you love all year round! Do you like this scarf? Are you a fan of Pier 1? What are your favorite prints of scarves? What have been your favorite winter trends so far? Start the convo below!